Text and photographs by Kyoichi Tsuzuki. Seigensha, Kyoto, 2008. 178 pp., 85 color illustrations, 10½x8". In fashion magazines, beautiful models live beautiful lives and wear beautiful clothes in beautiful homes; but as Tsuzuki comprehensively illustrates, the ones who buy the fashion brands are neither strikingly attractive nor occupy handsome dwellings. The photographer’s ‘Happy Victims’– who have dedicated their lives to the brands that they love – form the backbone of this impressive investigation. 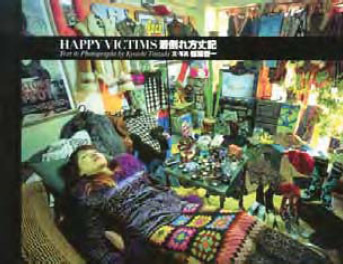 Here, collected over 85 full colour images are obsessive Japanese designer victims, photographed in their homes and surrounded by their valuable collections neatly laid out around them. Accompanying each photograph is a text explaining the individuals drive and logic behind their collection.